The Innovation Health Check can help establish how ‘Innovation’ oriented is your company. Innovation is an essential ingredient for economic and social growth. It helps to increase productivity by generating new products, processes and services and is instrumental in creating new and better jobs, reducing production costs, and increasing personal incomes. Without innovation, prices tend to rise, employment declines, and competition from foreign goods increase. Multiple studies have established that systematic Innovation results in four times higher growth rates, twice the employee added value & three times the sustainability for the enterprise (Source: Roper et al). While long term studies have shown that at least 50% of companies who do not actively innovate have ceased to trade after 10 years. 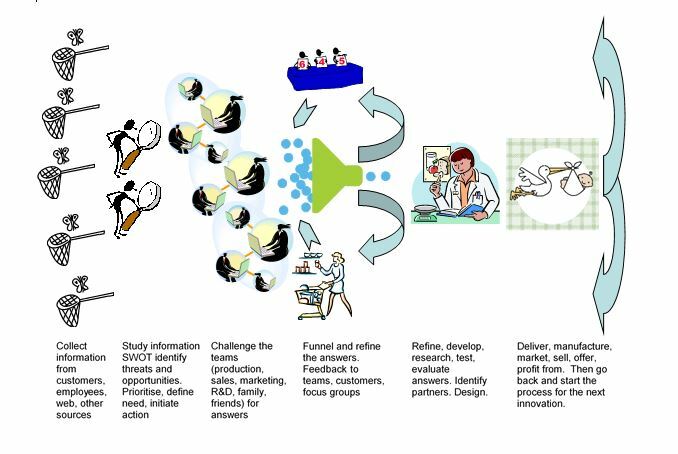 The innovation Health Check is designed to evaluate your innovation process. It looks at how the process operates from the outset, capturing customer needs (stated and unstated), idea generation, concept development, product/service development up to the commercial realisation stage and all steps in between. The Innovation benchmark will explore how this process is impacted by company culture, business strategy & structure, the company capability & resources and the level of innovative processes that are in place. Many innovations do not involve technical development either directly, or at all – such as development of a novel business model. There is a vast amount of existing knowledge we can use for innovations. Technology development and technology integration can be important for some companies and for this application a well-functioning applied research activity is needed. Research shows that many people have an incomplete understanding of innovation. 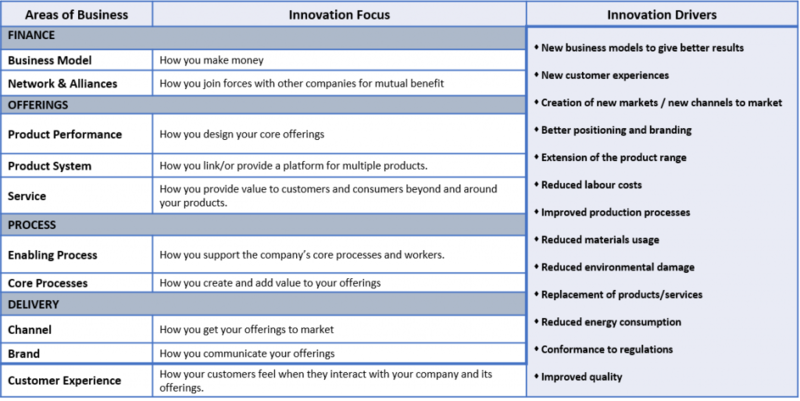 Many companies equate innovation with the development of new products, but new process or service innovation may be more relevant. In an Innovation context ‘new product development’ on its own may provide little or no return. Would you recognise successful Innovation? Successful innovation has the potential to add value throughout the entire business. It is essential to observe and measure throughout the Innovation process. A system of metrics and decision gates will objectively show your progress and success each step of the way – Plan, Do, Check, Act. Innovation can be found in many areas of the business. 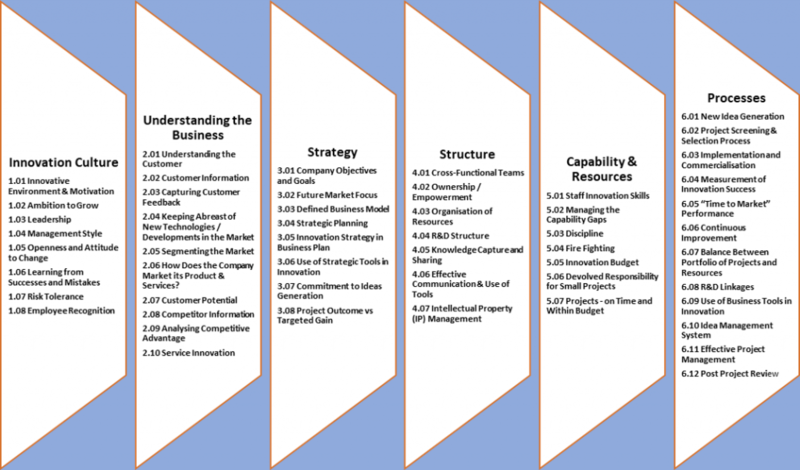 Successful businesses can be built and grown by developing customer offers in a number of areas of business such as those identified below. What are the benefits of paying more attention to Innovation? Changing things within the company can be a disruptive and expensive business since it soaks up resources, may disrupt commercial activity and can cause uncertainty and difficulties during development. The intended pay-back is in enhanced commercial performance delivered by differentiators of the product/process, service or business model innovations. It can also lead to efficiency savings, greater reliability with less rework, better margins and expanded markets. By having a structured and comprehensive innovation system within the company, downside costs can be minimized, planned development timelines can be minimised and successful commercial outcomes become more likely. Most successful companies have all, to some extent, reinvented significant aspects of their business over time in response to changing market conditions, opportunities and threats. Companies who appreciate the acknowledged benefits of systematic Innovation recognize that change is constant and that forward planning and a systematic approach pay dividends. As can be seen from the above Innovation has the potential to add value throughout the entire business. If an Innovative culture is successfully embedded it results in ‘Innovation as being everyone’s job’ resulting in ongoing measurable improvements.This will, in turn, deliver improved company performance, customer satisfaction and ultimately increased profitability. 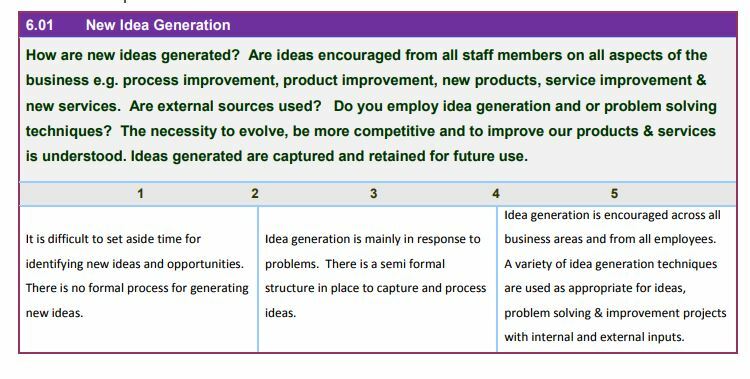 Innovation culture is the first of six parts to this questionnaire. It is important because without the right culture in place, it is difficult to implement and sustain a proactive innovative approach to company growth. Managing success, learning from failure, managing & tolerating risk including an appropriate reward structure. Understanding the business is the second part of the questionnaire. It is important that the company has a clear understanding on all aspects of the business and how they impact on performance. Strategy is the third part of the questionnaire. It is important for the company to have a clear view of how it will grow and to focus its resources to maximise its return. Structure is the fourth part of the questionnaire. It is important that the company is structured in an appropriate way to achieve its strategic goals. Appropriate processes to best manage different areas of businesses such as sales, marketing, operations and R&D etc. Capability and Resources is the fifth part of the questionnaire. It is important that a company has sufficient financial resources, the capability to achieve its goals, identify gaps and establish appropriate skills. Resource requirements are identified such as equipment, third party support etc. Processes is the sixth and final part of the questionnaire. It is important to give structure to the innovation process and to be able to evaluate outcomes in a timely manner. Use of business and innovation tools with appropriate linkages to third level colleges, customer supply chain, competitors and potential licence partners etc. “Practice’ refers to the processes that an organisation has in place to design, manufacture, deliver and measure its products and services. ‘Performance’ refers to what is achieved, with emphasis on operational aspects including product/service quality, cost, delivery, innovation and sustainability. Each question displays 3 statements that portray ‘best practice’ (in the right column) and something not as good as ‘best practice’ (in the middle and left columns). Choose the statement which is the closest to the current situation in your business. There is no ‘pass’ or ‘fail’ – the intention is to help your business to identify strengths and opportunities for improvement.